As part of the government’s ’Look-East Policy’ and its economic integration with the Association of Southeast Asian (ASEAN) countries, India is now taking the initiative of promoting India-Mekong Economic Cooperation. Both sides are also planning for a Mekong-India Economic Corridor which will form an integral part of the India-ASEAN connectivity. India had been working upon the idea to promote Mekong-Ganga Cooperation which includes India, Cambodia, Laos, Myanmar, Thailand and Vietnam for a very long time. It was originally decided as part of the Bay of Bengal Initiative for Multisectoral, Technical, and Economic Cooperation (BIMSTEC) initiative in 2004. However, it seems the idea is now gaining some traction as India prepares to sign the much-awaited free trade agreement on services and investment with ASEAN in December, which will then become India-ASEAN Comprehensive Economic Partnership Agreement (CEPA). The Mekong-India Economic Corridor (MIEC) will be a network of land and sea infrastructure and the proposal is currently being studied by ministry of external affairs (MEA). The basis of this corridor will be the larger India-ASEAN connectivity plans. It envisages the linking of vibrant emerging economies in the ASEAN region with India. Minister of external affairs Salman Khurshid will also be addressing a seminar on this jointly organized by the Confederation of Indian industry (CII) and Asian Development Bank (ADB) on November 19. It will also be addressed by department of economic affairs secretary Arvind Mayaram, Vietnamese trade minister Nguyen Cam Tu, Pan Sorasak, secretary of state, commerce ministry of Cambodia and Yoshiro Kosaka, Head World Customs Organisation (APAC) among others. The Mekong Ganga Cooperation (MGC) includes India, Cambodia, Lao PDR, Myanmar, Thailand and Vietnam for cooperation in trade, tourism, culture, education, as well as transport and communication. The prospect of further liberalization between ASEAN and major regional economies, including India , was aided by the agreement in November 2012, to begin negotiations in 2013, on a Regional Comprehensive Economic Partnership (RCEP). The recent political reform process in Myanmar, a key bridge between the regions—now makes possible, land connectivity between South and Southeast Asia, which was not feasible a few years ago, according to a study done by CII. Trade between India and ASEAN have risen by nearly 10 times in last 11 years to $76 billion in 2012-2013, surpassing the set target of $70 billion. 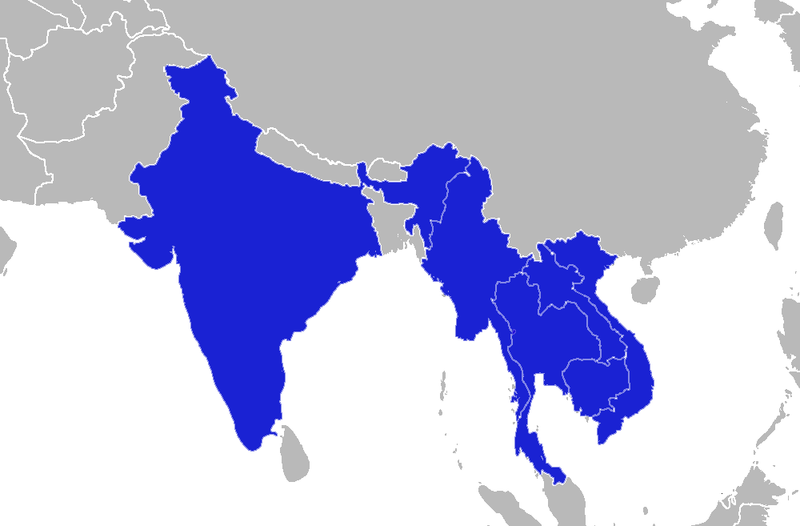 India and ASEAN has a combined population 1.8 billion. It is expected that bilateral trade will reach $100 billion by 2015 with the implementation of India-ASEAN CEPA in July 2015. Mekong-India connectivity is currently being addressed as part of the Asian Highway Network and Trans-Asian Railways being promoted by the United Nations Economic and Social Commission for Asia and the Pacific (UNESCAP).